Twenty-six Congressional Democrats will boycot Benjamin Netanyahu’s Congressional Speech on the survival of Israel. They don’t want to hear what he has to say about the threats against Israel. A photo from one of the rallies to wipe out Israel held in Iran in October, 2005. 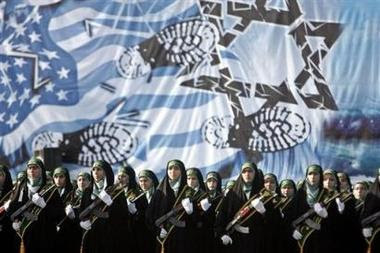 Backdropped by an anti-Israeli and anti-American painting, Iranian female paramilitary militias (Basiji), parade in front of supreme leader, Ayatollah Ali Khamenei, unseen, in Tehran, Iran. Obama National Security Adviser Susan Rice told Charlie Rose on Tuesday that Benjamin Netanyahu’s upcoming speech before Congress on the survival of Israel is “destructive” to the US-Israel relationship. Susan Rice, President Barack Obama’s national security adviser, said Israeli Prime Minister Benjamin Netanyahu’s planned speech in front of a joint session of Congress will be “destructive” to U.S.-Israel relations. “What has happened over the last several weeks, by virtue of the invitation that was issued by the Speaker [John Boehner] and the acceptance of it by Prime Minister Netanyahu two weeks in advance of his election, is that on both sides, there has now been injected a degree of partisanship, which is not only unfortunate, I think it’s destructive of the fabric of the relationship,” Rice told PBS’ Charlie Rose. Obama has said he will not meet with Netanyahu ahead of his speech in March, saying it would be “inappropriate” to meet with the leader two weeks before the Israeli elections. Netanyahu was invited to speak in front of a joint session of Congress by House Speaker John Boehner (R-Ohio), who did not seek approval from the White House before sending the invitation.